Mr. Ping. He’s just really awesome!!! My favorite Kung Fu Panda character is PO! My favorite character is Mr. Ping! Mr. Ping is my favorite character, I really like them all. Kung Fu Panda 2 Blu-ray in Dolby TrueHD. 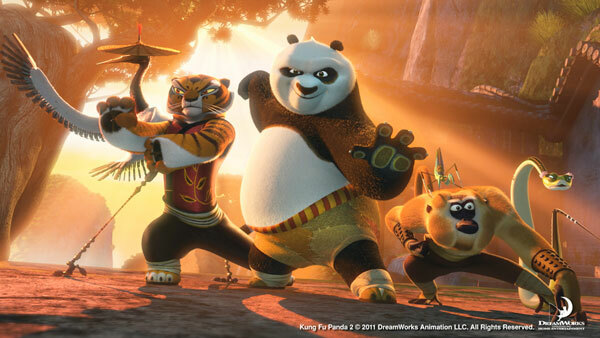 Favorite character is the Panda! The Kung Fu Panda 2 video and my favorite is the monkey. Kung Fu Panda 2 on DVD. Our fav character is Master Tigress. Its being release on blu -ray! Kung Fu Panda 2 on Blu Ray! His surprise for the children was Kung Fu Panda 2 DVD. it is the kung fu panda 2 blue ray dvd video. Kung Fu Panda 2 on Blu-ray! What a surprise. Po was my favorite as well. Mr. James Hong surprises the children with a DVD and the news that this Kung Fu Panda 2 on Blue Ray in HD, and also tells them that he is the voice. I love Po, however, the sarcasm of Master Crane is my preference. What suprise does Mr. Hong have for the children in the video? A Blu Ray DVD of Kung Fu Panda 2!